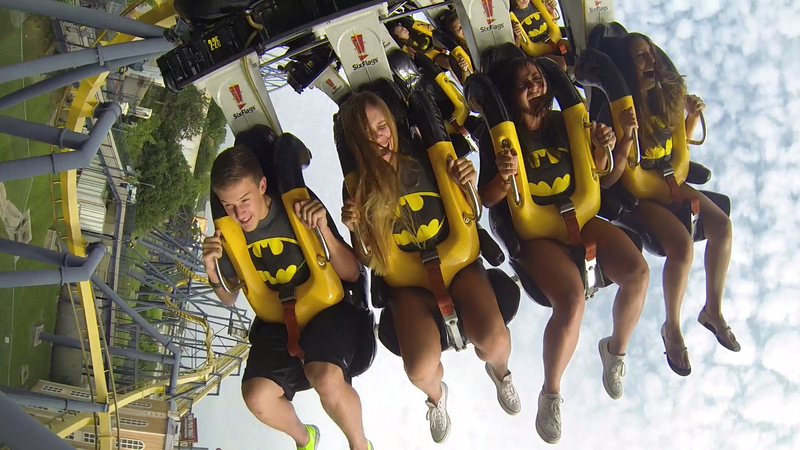 Thirteen thrill rides that loop, launch, roar and soar will take center stage when Six Flags Great Adventure celebrates National Coaster Day on Sunday August 16, 2015, presented by Outback Steakhouse. Thirteen thrill rides that loop, launch, roar and soar will take center stage when Six Flags Great Adventure celebrates National Coaster Day August 16, presented by Outback Steakhouse. “Our coasters rank among the best in the world, so what better place to celebrate roller coasters than at the world’s largest theme park,” said Park President John Fitzgerald. In celebration of National Coaster Day, Six Flags Great Adventure will host a fiesta in Plaza del Carnaval, a Mexican-themed section that features the intense, hybrid wooden coaster El Toro and the looping thrills of the new El Diablo. Special activities also include coaster trivia and prizes, a live DJ and Latin dance lessons outside the new Macho Nacho cantina which will offer special deals for its grand opening. Great Adventure, which was recently named one of the Best Amusement Parks for Families in 2015 by Family Vacation Critic, TripAdvisor’s family travel site, will provide special admission and exclusive ride time benefits to Outback Steakhouse restaurant customers and Six Flags Season Pass holders and Members – a half-hour of early ride time between 10 and 10:30 am on both El Toro and El Diablo.